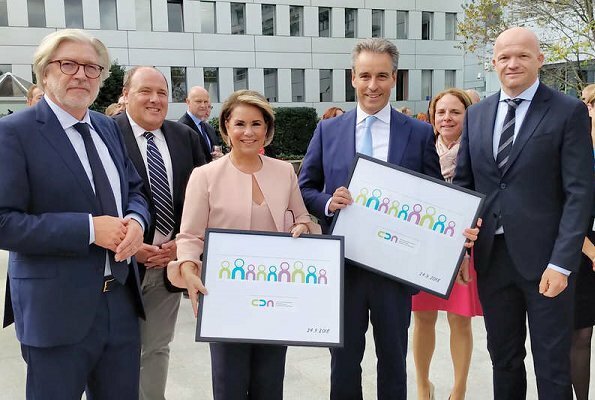 On September 24, 2018, Grand Duchess Maria Teresa attended the opening of the Center for the Development of Apprenticeships "Grand Duchess Maria Teresa" (CDA). That initiative was started by the Grand Duke and Grand Duchess Foundation for children with learning disability and aims to help the public. Beautiful outfit, understated and pretty makeup and hair -- total win. She looks very good, pale pink is very becoming color to her. She looks great - pretty shade of pink. She is beautiful. Such an inspiration to those of us of a similar age! GD Maria Teresa looks wonderful in this outfit. Her smile and hair are super too. I love this new hairstyle on her. Combined with the weight loss, she seems to have a newfound joie de vivre!